Pat Judge said $500 isn’t enough to inspire him to give up his hobby. Pat Judge, an avid sport fisherman, has been walking around with a $500 check in his pocket for a week, trying to decide whether to cash it. That’s because the money comes with a catch: Judge must agree to turn in his $10 recreational saltwater fishing license for the year. In an unusual experiment being conducted only in Massachusetts, the federal government is surveying anglers to figure out how much it would cost to persuade Judge and 1,899 others not to fish off the coast. But officials say the purpose is not to actually reduce fishing. Instead, they say, the survey is intended to measure the worth of recreational saltwater fishing to the estimated 1.2 million residents and visitors who do it annually. The results could be used in variety of ways, officials say, such as to calculate the potential loss to anglers if an oil spill or other environmental disaster halted recreational ocean fishing. 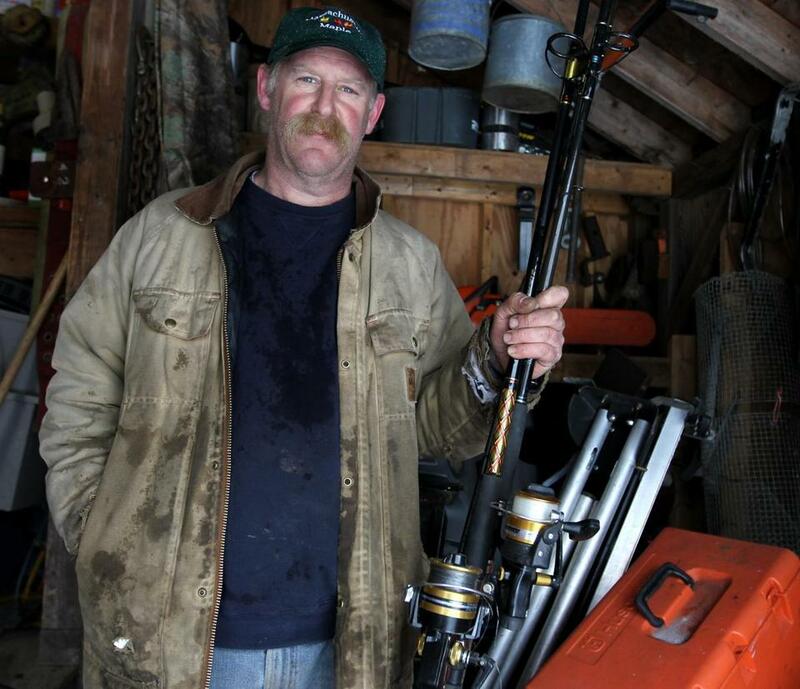 But after years of government restrictions on commercial fishermen, and more expected because of plummeting cod stocks, some recreational anglers wonder if officials are up to something more sinister: revoking their right to fish. The no-fishing offer, which ranges from $15 to $500, is raising hackles among those who consider it another government assault on New England’s fishing industry. The National Oceanic and Atmospheric Administration has allocated about $145,000 to conduct the survey over the next several months, with about $75,000 allotted for cash offers, said Scott Steinback, a NOAA economist who came up with the idea. Mailings are going out at random to fishermen who have registered for a 2012 recreational saltwater permit. Five hundred of those letters will include an actual check as an enticement to give up their permit, 700 will receive a hypothetical cash offer, and 700 will be asked how willing they would be to pay an amount other than $10 for their permit. 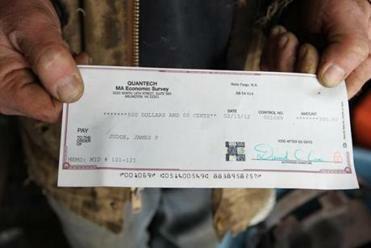 The check amounts differ so officials can gauge the value people put on the right to fish. Researchers will compare the rates of acceptance between the real offers and the hypothetical queries to evaluate differences between the approaches and to, ultimately, calculate the total dollar value fishermen place on the opportunity to cast their lines. Steinback concedes that the survey and its cost are likely to result in puzzlement, or worse. So why just Massachusetts? Limited funding and concerns about negative feedback prompted officials to restrict the study to one state, he said. Pat Judge shows the $500 check he was given by the government to give up his right to fish for one year. Some fishermen say they were surprised by the solicitation, while others assumed it was a scam. They wondered, would a government so hard up for cash want to pay them to keep their rods and reels in storage? And why would they give $500 for a license that was worth $10? Rumors about the government’s motives spread among saltwater fishermen once the letters started going out last week. Patrick Paquette, of the Massachusetts Striped Bass Association, said fishermen worry that the results will be used to increase permit rates. He added that the timing was poor, coming just a year after the state first began collecting fees for saltwater fishing. In addition to the $10 fee for a saltwater license, freshwater permits cost $27.50, and lobster/crabbing licenses cost $40. State and federal officials say the survey will be helpful to regulators who may need to make decisions about allocating fish stocks between commercial and recreational users. It will be used in part for ocean planning and prioritizing competing uses, according to Nichola Meserve, a fisheries policy analyst at the Division of Marine Fisheries. The state advisory promised that the results will not be used to increase fees for permits, but some survey recipients remain skeptical after receiving questionnaires that asked whether they would be willing to pay $55 or more for a license. “This irritates me,’’ said Peter O’Neill of Shrewsbury, who got a survey with the $55 question. Paying fishermen to stop fishing is not new for the US government. After the New England fleet became too large in recent decades, the government began buying boats from commercial fishermen and retiring their right to fish. But that kind of program has never been applied to recreational fishermen. Some local fishermen have already started to cash checks, while others, including Judge, have held off. Volunteers are not accepted - earlier this week, a woman tried to exchange her husband’s permit for money. Steinback is mildly concerned that there will be a run on permits from people looking for cash, something that could skew the experiment’s results. “The odds of receiving a check for up to $500 from this study are surely greater than winning the lottery,’’ he conceded. In 2011, 125,777 people got saltwater permits. So far this year, about 19,170 have paid for licenses. The moment people become owners of something, they tend to overvalue it, he said. Arieli conducted research on basketball tickets at Duke and found that people who had tickets to NCAA Final Four games wanted $2,000 to sell them, while individuals who didn’t have tickets were only willing to pay $100. Paquette said it would cost the government a lot of money to persuade him not to fish. Beth Daley of the Globe staff contributed to this story. Jenn Abelson can be reached at abelson@globe.com.